The Mau was a non-violent movement for Samoan independence from colonial rule during the early 1900s. Mau means 'opinion,' 'unwavering,' 'to be decided,' or 'testimony' denoting 'firm strength' in Samoan. The motto for the Mau were the words Samoa mo Samoa (Samoa for the Samoans). Similarly in Hawaii'an Mau means to strive or persevere, and is often linked with Hawaii'an poetry relating to independence and sovereignty struggles. The movement had its beginnings on the island of lavalava with a white stripe which was later banned by the colonial administration. 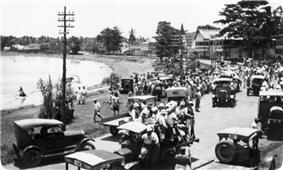 The Mau movement culminated on 28 December 1929 in the streets of the capital Apia, when the New Zealand military police fired on a procession who were attempting to prevent the arrest of one of their members. The day became known as Black Saturday. Up to 11 Samoans were killed, including Mau leader and high chief Tupua Tamasese Lealofi III with many others wounded. One New Zealand constable was clubbed to death by protesters. The Mau movement's efforts would ultimately culminate in the political independence of Samoa in 1962 but the height of the movement's activity in the Western Islands occurred in the late 1920s and early 1930s. Exile Lauaki Namulauulu Mamoe (photo by Thomas Andrew). 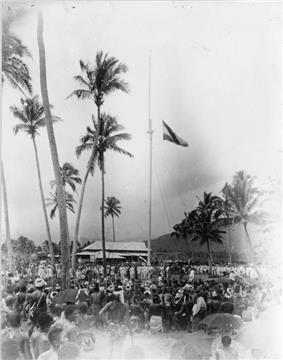 Raising the flag of German Samoa at Mulinu'u, 1900. (photo by AJ Tattersall). Broadly, the history of the Mau movement can be seen as beginning in the 1800s with European contact and the advent of Western powers, Britain, United States and Germany, vying for control of the Pacific nation. The country became German Samoa (1900–1914) followed by New Zealand colonial rule during which the Mau gathered national support. A key event occurred in 1908, in a dispute between the German colonial administration and the Malo o Samoa, or Samoan Council of Chiefs, over the establishment of a copra business owned and controlled by native Samoans. The dispute led to the eventual formation of a resistance movement called Mau a Pule on Savai'i by Lauaki Namulauulu Mamoe, one of the Samoan leaders from Safotulafai who was deposed by the German Governor of Samoa, Wilhelm Solf. 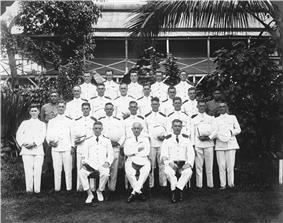 As well as deposing members of the Malo o Samoa, Solf called in two German warships as a show of strength. Faced with this demonstration of military force, and with the movement divided, Lauaki surrendered. In 1909, Lauaki and the other senior leaders of the Mau a Pule were exiled to the German colonies in the Marianas (North West Pacific) where they were to stay until 1914, when New Zealand took over Samoa as part of its Empire duties at the outbreak of World War One. Many of those exiled died before returning to Samoa. 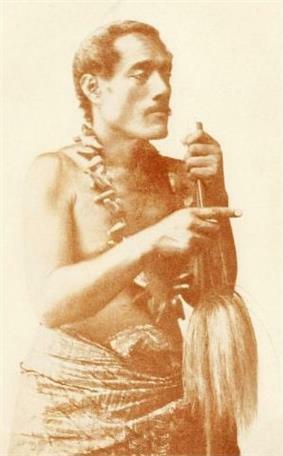 Lauaki died en route back to Samoa in 1915. The Samoan independence movement would not gain strength again until after New Zealand forces, unopposed by the German rulers, annexed Western Samoa in 1914, at the beginning of World War I. Military rule continued after the war ended, and in 1919, some 7,500 Samoans, around 22 per cent of the population, died during an influenza epidemic. It was already known that Samoans were susceptible to the smallest European diseases, as they had never encountered them before. 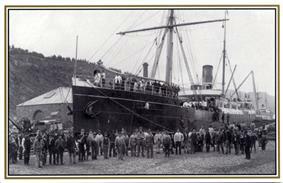 When the ship SS Talune arrived in Apia with its crew and passengers obviously sick with influenza, they were allowed to dock by the New Zealanders. Two days later the first deaths were reported. No attempt was made by the New Zealand administrators to quell or contain the spread, and after one week it had spread through the whole of Samoa. Whole families were killed, with such alarming speed that corpses lay around for weeks without being buried. They were either thrown in mass graves or left in houses which were torched. However, in American Samoa, where quarantine precaution measures had been adequately taken, there were no deaths. Upon learning of the current situation in Western Samoa, the American Governor offered help to Colonel Logan who was in charge; Logan was British born and hated Americans. He destroyed the telegram and cut off any other contact to American Samoa. The Americans had a large medical team who could have saved many lives. This catastrophic event was to lay a new foundation for discontent with an administration already perceived as incompetent and dishonest by many Samoans. The clumsy handling of Samoa's governance, the slow and deliberate erosion of traditional Samoan social structures by successive administrators, and a general failure to understand and respect Samoan culture also sowed the seeds for a revitalised resistance to colonial rule. Logan was replaced by Colonel Robert Tate. The groundswell of support among Samoans for the Mau came from the leadership of Samoan matai, the heads of families in Samoa's traditional socio-political structure. Family and chiefly title connections, a central part of Samoan culture, were used to harness support. The success of the Mau in gathering national support showed that fa'a Samoa was still strong  despite colonialism. Samoans of mixed parentage, facing discrimination from both cultures but with the advantage of cross-cultural knowledge, also played a key role in the new movement. Olaf Frederick Nelson, one of the leaders of the new Mau movement, was a successful merchant of mixed Swedish and Samoan heritage. Nelson was the richest man in Samoa at the time and well-travelled. He was frustrated by the colonial administration's exclusion of native and part-Samoans from governance. Notably, he was one of many who had lost a child to the influenza epidemic of 1919 in addition to his mother, sister, only brother, and sister in-law. Although classified as a European, he considered himself Samoan "by birth blood and sentiment." In 1926, Nelson visited Wellington to lobby the New Zealand government on the issue of increased self-rule. During his visit, the Minister for External Affairs, William Nosworthy, promised to visit Samoa to investigate. When Nosworthy postponed his trip, Nelson organised two public meetings in Apia, which were attended by hundreds, and The Samoan League, or O le Mau, was formed. The Mau published the Samoa Guardian newspaper as a mouthpiece for the movement. To demonstrate the extent of popular support for the Mau, Nelson organised a sports meeting for movement members on the King's Birthday, in parallel with the official event, and held a well-attended ball at his home on the same night. 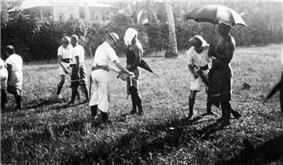 Movement members had begun to engage in acts of noncooperation: neglecting the compulsory weekly search for the rhinoceros beetle, enemy of the coconut palm, thereby threatening the lucrative copra industry. When New Zealand administrators imposed a per-capita beetle quota, many Samoan villages resisted by breeding the insects in tightly-woven baskets rather than comply with the orders to scour the forests and collect them. In 1927, alarmed at the growing strength of the Mau, George Richardson, the administrator of Samoa, changed the law to allow the deportation of Europeans or part-Europeans charged with fomenting unrest. This action was presumably taken on the assumption that the growing movement was merely a product of self-interested Europeans agitating the native Samoans. In reality, however, the Mau was built upon the traditional forms of Samoan political organisation. In each village that joined the movement, a committee was formed, consisting of the chiefs and "talking men". 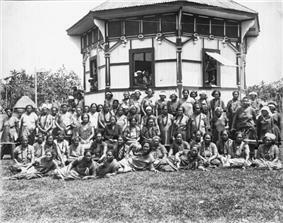 These committees formed the basic element of an alternative system of governance, and the tendency of Samoans to unite under traditional leadership meant that by the mid- to late 1920s, around 85% of the Samoan population was involved in open resistance. Following another visit to New Zealand to petition the Government, Nelson was exiled from Samoa along with two other part-European Mau leaders. The petition, which lead to the formation of a joint select committee to investigate the situation in Samoa, quoted an ancient Samoan proverb: "We are moved by love, but never driven by intimidation." The Mau remained true to this sentiment, and despite the exile of Nelson, continued to use civil disobedience to oppose the New Zealand administration. 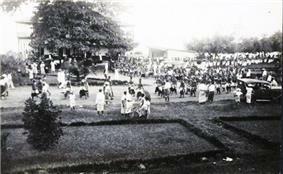 They boycotted imported products, refused to pay taxes and formed their own "police force", picketing stores in Apia to prevent the payment of customs to the authorities. Village committees established by the administration ceased to meet and government officials were ignored when they went on tour. Births and deaths went unregistered. Coconuts went unharvested, and the banana plantations were neglected. As the select committee was forced to admit, "a very substantial proportion of Samoans had joined the Mau, a number quite sufficient, if they determined to resist and thwart the activities of the Administration, to paralyse the functions of government." Richardson sent a warship and a 70-strong force of marines to quell the largely non-violent resistance. 400 Mau members were arrested, but others responded by giving themselves up in such numbers that there were insufficient jail cells to detain them all, and the prisoners came and went as they pleased. One group of prisoners found themselves in a three-sided "cell" which faced the ocean, and were able to swim away to tend to their gardens and visit their families. With his attempt at repression turning to ridicule, Richard offered pardons to all those arrested; however, arrestees demanded to be dealt with by the court, and then refused to enter pleas to demonstrate their rejection of the court's jurisdiction. The new administrator, Stephen Allen, replaced the marines with a special force of New Zealand police, and began to target the leaders of the movement. Tupua Tamasese Lealofi III, who had led the movement following the exile of Nelson, was arrested for non-payment of taxes and imprisoned for six months. On 28 December 1929 — which would be known thereafter as "Black Saturday" — New Zealand military police fired upon a peaceful demonstration which had assembled to welcome home A.G. Smyth, a European movement leader returning to Samoa after a two-year exile. Reports of the massacre are sketchy because the official cover-up for the incident was so effective. Tupua Tamasese Lealofi III had rushed to the front of the crowd and turned to face his people; he called for peace from them because some were throwing stones at the police. With his back to the police calling for peace he was shot in the back; another Samoan who rushed to help him was shot in both legs while cradling his head. Another who had attempted to shield his body from the bullets was shot. Two more rushing to help were killed before they could reach him. Shooting stopped at around 6.30 am. Eight had died, three would later die, and about 50 were wounded. One policeman had also been clubbed to death. Among the wounded were terrified women and children who had fled to a market place for cover from New Zealand police firing from the verandah of the station, one of them wielding a Lewis machine-gun. My blood has been spilt for Samoa. I am proud to give it. Do not dream of avenging it, as it was spilt in peace. If I die, peace must be maintained at any price. Grave of Tupua Tamasese Lealofi III in Lepea village with inscription of his last words in the Samoan language. Following the massacre, male Mau members fled to the mountains, the traditional retreat of those defeated in war. The resistance continued by other means, with the emergence of a women's Mau to continue the councils, parades and symbolic protests that the men now could not. For the women's movement, even the game of cricket represented an act of defiance inviting official harassment. 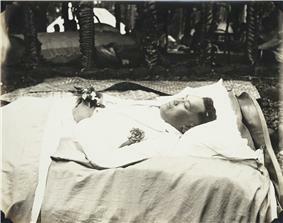 Tupua Tamasese Lealofi III lying in state at Vaimoso village, 1930. The day after his funeral, his village was raided by New Zealand military police; they ransacked houses, including those of the Tamasese's mourning widow and children. Colonel Allen requested reinforcements from New Zealand after he claimed 2000 Mau had caused a riot. On 12 January 1930 the Royal New Zealand Navy flagship Dunedin brought marines to hunt down members of The Mau. The Mau, who were fully committed to Passive Resistance, easily slipped through the jungle; the marines were slow because they were carrying too much weaponry and didn't know the bush like The Mau. The Mau no longer trusted New Zealand police, and this fear only got worse after a 16-year-old un-armed Samoan was shot and killed while running away from a marine, whose excuse he thought the boy was going to throw a stone was accepted as an adequate defence and no charges were laid. A truce was declared on 12 March 1930, after another child was killed by New Zealand marines who were now suffering heat exhaustion and tropical infections. The male Mau members returned to their homes, on the condition that they retain their right to engage in non-cooperation. Meanwhile, Nelson and other exiled leaders continued to lobby the New Zealand Government and communicate their progress to the Mau. In 1931, news of the growing resistance to the British rule of India reached many Samoan villages. High chief Mata'afa Faumuina Fiame Mulinu'u I, a leader of the Mau who became President of the Mau following Tamasese's death, circa 1930. 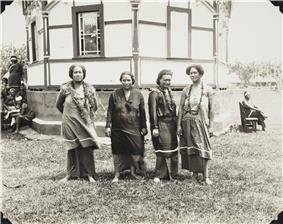 The leaders of the women's Mau; Mrs Tuimaliifano, Mrs Tamasese, Mrs Nelson, Mrs Faumuina, ca 1930, (photo by Alfred John Tattersall). The Mau movement had not gone unnoticed by the population of New Zealand, and the treatment of Samoans at the hands of the administration had become a contentious issue in some New Zealand electorates during the 1929 election. 1936 marked a turning point for Samoa, with the election of a Labour Government in New Zealand and the subsequent relaxation of repression by the Samoan administration. Under the new Government, there was slow movement towards greater involvement of Samoans in the administration of their own country. When Western Samoa gained its independence in 1962, Tupua Tamasese Meaole, son of the Mau movement leader, became its first co-head of state with Malietoa Tanumafili II. Fiame Mata'afa Faumuina Mulinu’u II (1921–1975), the son of another high chief and Mau leader Mata'afa Faumuina Fiame Mulinu'u I, became the first Prime Minister of Samoa. In July 1997, the Samoa Constitution was amended to change the country's name to Samoa, and officially the Independent State of Samoa. In 2002, Helen Clark, Prime Minister of New Zealand made an unprecedented move and apologised to Samoa for New Zealand's treatment of Samoans during the colonial era. Clark made the apology in the capital Apia during the 40th anniversary of Samoa's independence. The apology covered the influenza epidemic of 1918, the shooting of unarmed Mau protesters by New Zealand police in 1929 and the banishing of matai (chiefs) from their homes. The Mau had manifestations in both the Western and Eastern Samoan island groups. The Mau movement emerged as an articulated of an indigenous response to the U.S. annexation of the eastern Samoan islands in 1899. It featured the signing of petitions in efforts to enact political transformation vis-a-vis American colonial government, and included effort to resist taxation of copra. There was an American Samoa Mau that took place in Tutuila in American Samoa in the 1920s. It emerged as a result of fluctuating prices of copra and represented an open affront to the American Navy and its patterns of treatment of the indigenous Samoan people and failure to respect Samoan customs, conceptions of self-government and the Samoan way of life. This movement received a lot of press in the United States, both favourable and unfavourable. The leader of the movement, Samuel Ripley of Leone, Tutuila, was in effect exiled from American Samoa, when he was barred by the US Navy authorities from disembarking from a ship returning to Pagopago from California, and he was never allowed to return to his homeland. He eventually became the mayor of Richmond, California. The United States sent a committee to American Samoa in 1930, including US citizens from Hawaii who had a prominent role in the overthrow of the Hawaiian kingdom and Queen Lili'uokalani. Their report, favourable to the US position, had a considerable influence on US policy, and the American Samoa Mau was totally suppressed by the US. Its influence however continued to be felt. A Samoan hip hop group that was founded in 1990 by Kosmo, MC Kha Tha Feelstyle Orator and DJ Rockit V. The Mau was named for the Mau movement. The motto of the group became the same as the motto of the Mau movement; Samoa Mo Samoa, or Samoa for Samoans. The Mau has now reformed as the group Rough Opinion. The group still carries the message of the Mau movement as their theme. ^ a b c  Guardians of the West by Albert Wendt. Retrieved 21 February 2009. Chapell, David. "The Forgotten Mau: Ant-Navy Protest in American Samoa, 1920-1935." Pacific Historical Review 69.2 (2000): pp.217-260.